Mukta Event Managers are one of the most professional event managers in Hyderabad. We try to provide event management services at an affordable cost. 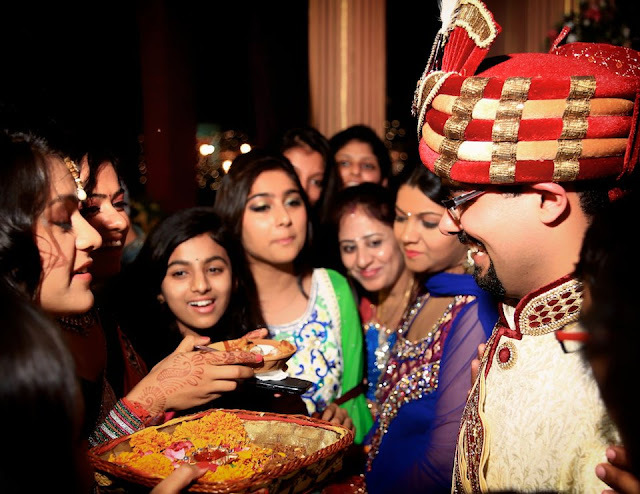 In this series we are providing a glossary of all the terms regarding Indian Marriages. Madhuparka is a beverage made of honey, curd, ghee or butter. Madhuparka is offered to the bridegroom by bride’s parents on his arrival at the venue. In certain traditions, this is given to both the bride and the groom. It is used as a respectful offering to a guest in some traditions. It is also offered as prashadh or prasadam at temples. The arrival of the bridegroom is celebrated by the bride’s family and the bride’s parents greet the groom by offering Madhuparka to him. By offering this, the bride’s parents signify to the bridegroom that the bride would change all sourness in their life into sweetness. In Gujarati weddings, the groom’s feet are washed and then Madhuparka is offered as a token of love along with some other presents to him. In Telugu weddings, the bridegroom is welcomed by the bride’s parents at the wedding mandap. The groom’s feet will be washed with water and he will be offered flowers and Madhuparka. In Punjabi weddings, Madhuparka is given to both the bride and the bridegroom and this ceremony marks the beginning of the actual wedding ceremonies. Years ago, the Madhuparka ceremony was used by Rishis and sages as a means to welcome their guests.